History/Mythology: Kyanite did not receive its name until the eighteenth century due to the fact that up until then most blue crystal/stones were put in the same category. 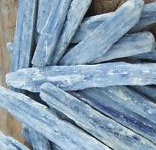 So even though Kyanite has been used and around for a long time there are no existing traditions as to its use. Healing: Treats muscular disorders, fevers, thyroid, adrenals, and a natural pair reliever, lovers blood pressure, and releases excess weight. Balances yin-yang energy. 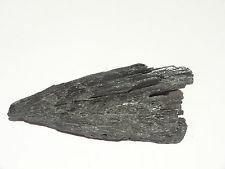 Kyanite can be worn in direct contact with the body. Pendant are a wonderful way to use Kyanite as it places the stone closes to the relevant chakra. Can be used in all meditations or gridding.